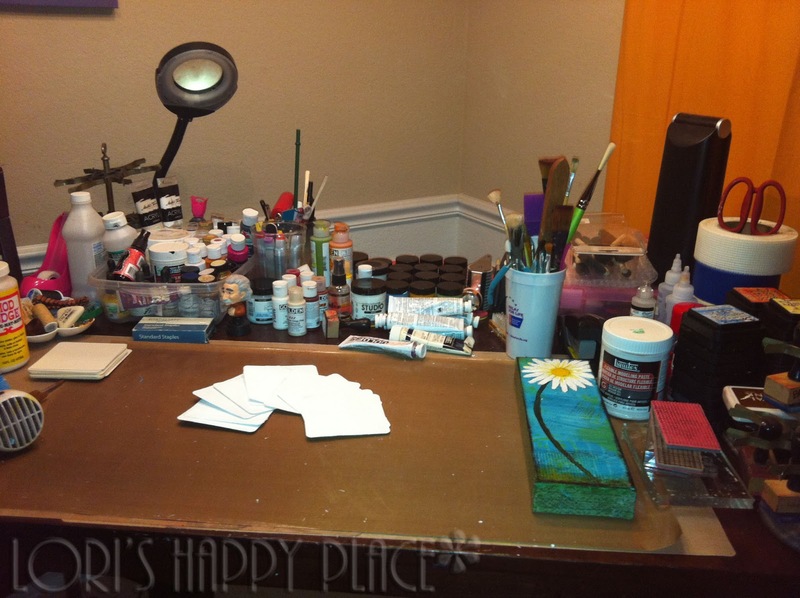 i always love it when canvases are painted on the sides - love yours! Poor Lori, hope you are all better very soon. Love your canvas, very cheering raised a smile on this bleak day. So glad to see you in our Wednesdays, you'll have so much fun, I'm sure. I love your canvas and am sorry to hear your not feeling too good. Thank you for still sharing. Oh Lori, poor you. Flu is horrible, especially when the littlies have it too. Hope you are all feeling better very soon. Thanks so much for sharing your canvas, it's gorgeous. I love all the detail and that grid texture at the bottom is great. Poor you, flu is the pits....and trust your young un to share it so freely.... The canvas is still gorgeous and I LOVE what you've done to the sides, fab!! Lori, I hope you're both feeling better soon! Your canvas is beautiful! Love the canvas! Hope you and yours are all better soon! Sorry to hear that you have got flu. Hope you will soon be better! Oh Lori, I hope you beat that flu pretty quick and get well again. Think of that canvas waiting for you! I love the detail of the script around the border and look forward to seeing what words you add. What a fabulous Daisy canvas - I love the vivid colours, and that great script on the sides... Thanks for your visit, and belated happy WOYWW! Thanks for visiting my blog yesterday, always appreciated but even more so as you have the flu. Hope you are feeling a bit better today. 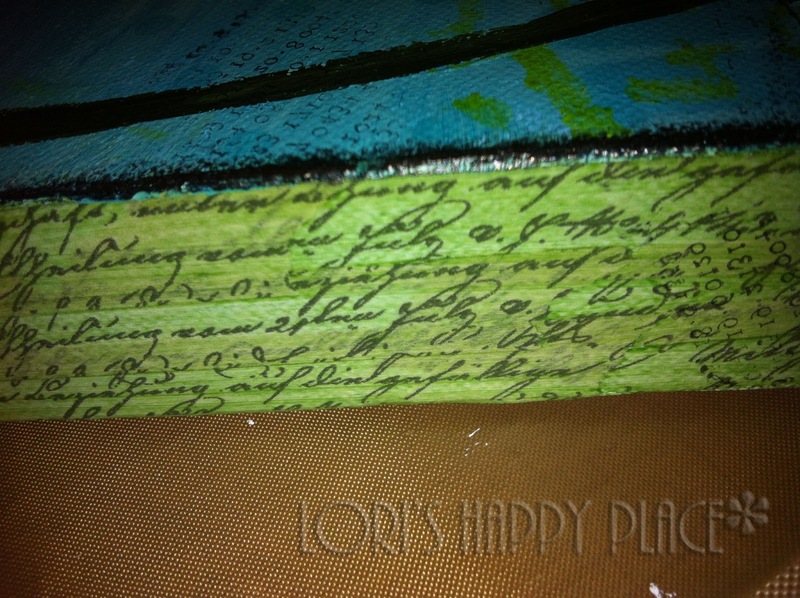 Love the canvas, and, coincidentally I was only thinking today that I may add daisies to my green journal page - one of my favourite flowers because of its simplicity. Snowing here this morning so I may just stay in and craft. Love your canvas and really hope by now you are feeling much better. Hi Lori, Thanks for stopping by. I'm late because the internet keeps falling over! I like your canvas, so bright and cheerful! Hope you feel real better soon. Beautiful work, Lori! Can you please tell me how you make your coasters? I had some done by a commercial photo lab (very expensive!) using some of my zentangle designs but it would be nice to know how to make my own. Are yours heatproof and waterproof? Thanks for your visit - as for being a day late, no worries! As far as I'm concerned, any post up to 23:59 on the Tuesday is not too late for WOYWW!! I love having the comments staggered through the week. You take care, and get well soon! Hope you're feeling better...love your neat desk. That canvas is gorgeous. Lori thanks for the visit. Love your beautiful canvas. Hope your home is germ free soon, this house has been hit this week too....oh the joys! Do hope you are coping with your little one being poorly and you too. Makes it so hard when you have the flu and when you have someone else with it. Hot drinks and rest are the only cures. Love your canvas - don't worry if the desk is the same next week even. What are you going to do with the coasters? I'm intrigued. Hope you feel better. Thank you for the visit. I hope you and your family get well soon! So far we have escaped the flu. Understandable why your desk is so neat and clean! Anyway, take care of yourself and thanks for visiting my space! I'm loving your daisy canvas, WOW! And scrolling through, you've got some awesome mixed media art going on. I'd love to be able to do that. Today I sat down with some digi mixed media elements and put together a poster of sorts for my OLW. Thankful for the work of others that I can apply to my own work with all due credit! I LOVE your daisy, Lori! That cerulean blue just makes it pop, and all the textural effects give it some nice depth. Hope you and your family are feeling better. My youngest daughter had the flu last week, and still has a little cough from the leftover junk. Blessings! 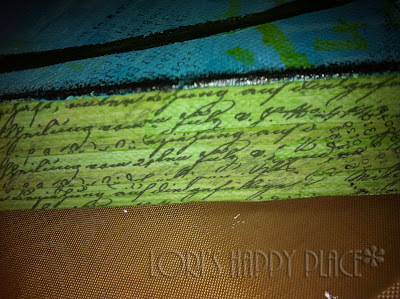 Gorgeous Daisy Canvas and thank you for dropping by and leaving such a lovely comment about my atc background. Hi Mamma bear...hope your flu is almost better and that you have found a title for your very pretty canvas! so sorry to hear you got the flu. i finally got talked in to a flu shot this year. hope it works. love your little canvas, especially the edges. what a great idea. i usually just paint black along the sides. Love your canvas, hope you feel better soon. Great close ups of your daisy.. Hope you are feeling better soon.. I found my owl on a weekend trip I did with hubby, he is quite heavy and comes in quite handy when I want something to stay in place when glue is drying..
Sandy :) Thanks for the visit..
I’m finally getting some time to drop in on a few more blogs this morning and wanted to say Thanks for stopping by mine this week. Well, I hope you are feeling a lot better by now Lori and that you’re more in the mood for crafting. I’m loving your canvas and that big bright Daisy is sure to bring a smile to everyone’s face. Thanks so much for stopping by the Playhouse and leaving your anniversary wishes, Lori, especially when you were suffering with the flu! I'm sorry I'm just now getting around to my WOYWW friends to return the flavor of their visit. I took some time off to celebrate with Mister. The outpouring of love has been quite overwhelming and wonderful! Nice messy inspiring desk! Now if only I could achieve the same look,I too might be able to something as wonderful as your canvases too! Love it! great detail with the script around the edge! Have a crafty week! 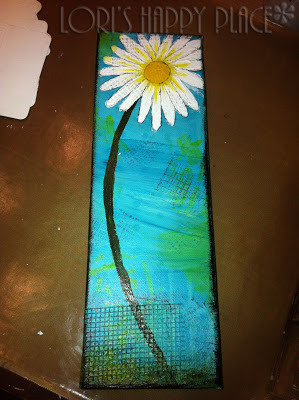 LOVE the daisy canvas! What a beautiful job you've done on it! I hope you're starting to feel a little better from the flu. That's no fun AT ALL. Love that canvas. Hope you are feeling better now! I just can't help myself. I set out just to look at all the wonderful desks, then end up distracted by works of art. I love your daisy canvas,as i do your heart. You put so much into them.. I love the colours too. SO late! But couldn't let it go - I adore the edging with the text and the lime and turquoise colour combo. Just FAB.